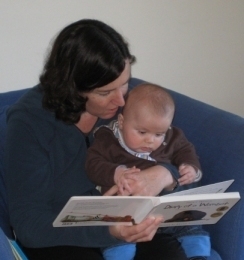 Supporting parents who want to give their child the best environment at home for developing language and early reading skills is the Early Reading Together® Programme. Early childhood services and schools can provide the programme for parents, and it is usually implemented by junior school teachers and/or experienced early childhood educators along with a librarian from their local community library. Parents attend 3 short workshops of 1 hour and 15 minutes spread over 3 weeks. At these workshops parents are given information and have opportunity to find out how learning language and reading seems from a child’s point-of-view and what they can do to best help a child. Participation in the programme is open to any parent and does not depend on a parent’s reading ability, language, culture, or socio-economic background. It is a friendly and enjoyable programme that is very manageable for ECE services and schools to provide and that gives parents the right information and insights they need to enhance their child’s language and early reading development. To help all children to develop a love of language and reading and the range of language and literacy abilities they need to function confidently and effectively within their communities and wider society. Go to the Early Reading Together website for more information.